I'm trying to understand where GraphQL is most suitable to use within a Microservice architecture. There is some debate about having only 1 GraphQL schema that works as API Gateway proxying the request to the targeted microservices and coercing their response. Microservices still would use REST / Thrift protocol for communication thought. Another approach is instead to have multiple GraphQL schemas one per microservice. Having a smaller API Gateway server that route the request to the targeted microservice with all the information of the request + the GraphQL query. Having 1 GraphQL Schema as an API Gateway will have a downside where every time you change your microservice contract input/output, we have to change the GraphQL Schema accordingly on the API Gateway Side. If using Multiple GraphQL Schema per microservices, make sense in a way because GraphQL enforces a schema definition, and the consumer will need to respect input/output given from the microservice. Where do you find GraphQL the right fit for designing microservice architecture? How would you design an API Gateway with a possible GraphQL implementation? Having your clients talk to multiple GraphQL services (as in approach #2) entirely defeats the purpose of using GraphQL in the first place, which is to provide a schema over your entire application data to allow fetching it in a single roundtrip. Having a shared nothing architecture might seem reasonable from the microservices perspective, but for your client-side code it is an absolute nightmare, because every time you change one of your microservices, you have to update all of your clients. You will definitely regret that. GraphQL and microservices are a perfect fit, because GraphQL hides the fact that you have a microservice architecture from the clients. From a backend perspective, you want to split everything into microservices, but from a frontend perspective, you would like all your data to come from a single API. Using GraphQL is the best way I know of that lets you do both. It lets you split up your backend into microservices, while still providing a single API to all your application, and allowing joins across data from different services. 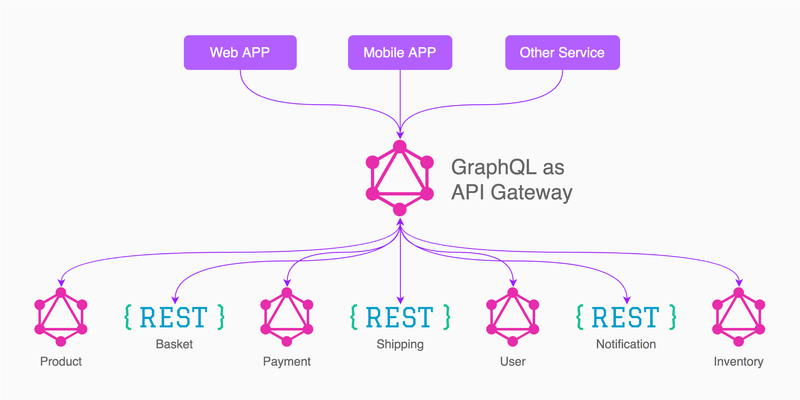 If you don't want to use REST for your microservices, you can of course have each of them have its own GraphQL API, but you should still have an API gateway. The reason people use API gateways is to make it more manageable to call microservices from client applications, not because it fits well into the microservices pattern. One of the main benefits of having everything behind a single endpoint is that data can be routed more effectively than if each request had its own service. While this is the often touted value of GraphQL, a reduction in complexity and service creep, the resultant data structure also allows data ownership to be extremely well defined, and clearly delineated. Another benefit of adopting GraphQL is the fact that you can fundamentally assert greater control over the data loading process. Because the process for data loaders goes into its own endpoint, you can either honor the request partially, fully, or with caveats, and thereby control in an extremely granular way how data is transferred. There are some great tools to combine schemas into one, e.g. graphql-weaver and apollo's graphql-tools, I'm using graphql-weaver, it's easy to use and works great. As microservice architecture does not have a proper definition, there is no specific model for this style but, most of them will come with few notable characteristics.In case of microservices architecture, each service can be broken down into individual small components, which can be individually tweaked and deployed without affecting application integrity. This means you can simply change a few services without going for application redeployment through custom microservices app development. More about microservices, I think GraphQL could work perfect in serverless architecture too. I don't use GraphQL but I have my own similar project. I use it as a aggregator which invoke and concentrates many functions into single result. I think you could apply same pattern for GraphQL. Not the answer you're looking for? Browse other questions tagged architecture microservices graphql or ask your own question. Are API Gateways always necessary in a Microservice styled architecture? how do i handle security within my microservice architecture?